Laura Schorr/Contributing Photographer The Koffman Southern Tier Incubator hosted an open house on Tuesday to welcome student-entrepreneurs to the building. The open house featured a tour of the incubator and speakers who emphasized the various resources the space offers startup businesses. The Koffman Southern Tier Incubator held its inaugural student open house at its high-technology space in Downtown Binghamton on Tuesday evening. 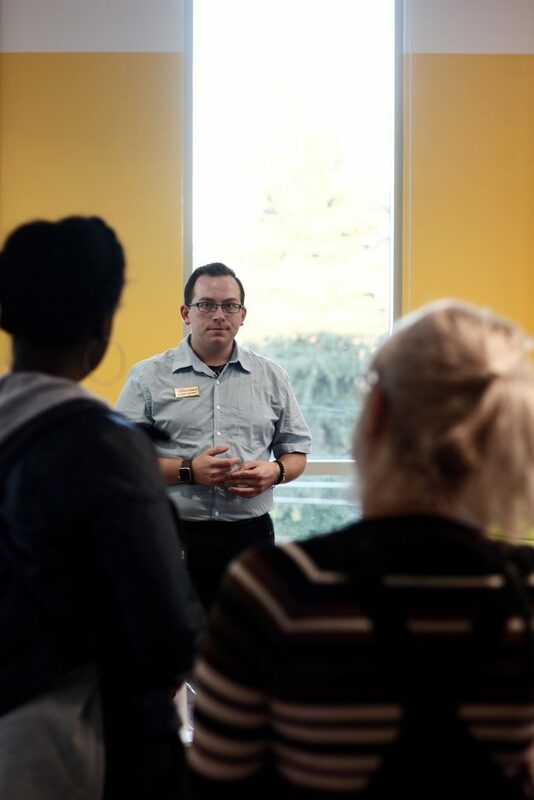 The Incubator’s directors and student developers led a tour around the three-story collaborative space, explaining the various opportunities that exist for students within the innovator-focused offices and laboratories. The initial plans for the Incubator date back to 2012, when Binghamton University President Harvey Stenger took office. Stenger was previously a dean at the University at Buffalo, where there was a successful business incubator that partnered with the university. “On his first day here, one of his questions was ‘Where’s your incubator?’” said Laura Holmes, assistant director of Entrepreneurship and Innovation Partnerships. According to Holmes, there were 22 startup offices located inside the Innovative Technology Center, however, these were limited to BU faculty and student use. In 2014, START-UP NY, a tax-incentive program, gave the University the opportunity to open startup “suites” to outside companies. The Incubator, which is open to both local and student business, accepts applications for a chance to work in the Downtown space. The startup’s mission needs to comply with the University’s aim of educating student entrepreneurs on the business process. Holmes said that despite low attendance at the open house, students have shown interest in the building. “We had a lot of students reaching out over the summer who wanted to come see the new Incubator building, so we’ve been doing a lot of individual tours,” Holmes said. According to Holmes, some nights there may be over a dozen people working in the space, but other nights there may be only one or two. Many of the people running startups are only working with the Incubator part-time, as they are full-time students or adults with other jobs and responsibilities. Matthew Gill, the founder of the Enhance VR startup and a senior majoring in electrical engineering, said that the Incubator provides resources for new entrepreneurs that cannot be found in any other project at the University. Melanie Chen, a junior double-majoring in computer science and music, learned about the open house from a friend’s father, who is involved with entrepreneurship in Ithaca and encouraged her to come check out the new Incubator.